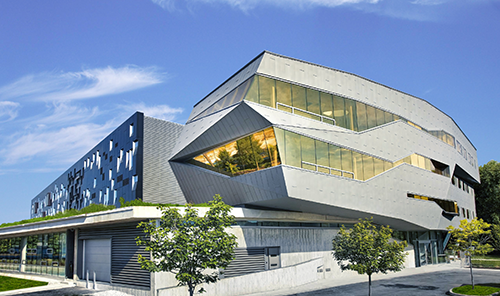 Perimeter Institute is located approximately 115 kilometers from Toronto, Ontario. If you need transportation while attending the summer school, we suggest you book your flight to arrive at Toronto International Airport (YYZ). A special rate has been negotiated with Airways Transit and information may be found below. Airways Transit connects Toronto Pearson airport with the Kitchener-Waterloo area providing 24 hour door to door shared ride service. For Toronto Pearson airport transfers we have obtained a reduced conference fare of $79.00 per person, one way, tax included. Advance reservations are required and travel dates must correspond to the event dates to qualify for the reduced fare. Book online at: http://conferences.airwaystransit.com. Enter booking code: TRISEP2015 (enter exactly as shown). By phone 24 hrs: 519 886 2121 – Identify yourself as a TRISEP delegate. If you are driving to Waterloo to attend the summer school, directions may be found below. • From the airport, follow signs for Highway 427 South/Highway 401. • Continue to follow signs for Highway 401 West - London. • Proceed West on Highway 401. • Exit Highway 401 at Highway 8 West. • Take exit 278 (Highway 8 West) and follow 8 West for 5 km to Highway 85, towards Highway 7 East. • Proceed on Highway 85 for 5 km to Bridgeport Road exit. Turn right at the off-ramp, traveling west. • Follow Bridgeport Road for 2 km into downtown Waterloo. • Bridgeport is a four-lane one-way road. It becomes Caroline Street at Albert Street. Continue straight ahead. • Travel forward another 200 metres, but ease over into the right-hand lane. As you go down a hill and around a curve, look for the green Perimeter Institute sign on the right hand side. The parking lot entrance is just after the sign (past the historic grist mill that sits on the edge of Silver Lake). • Turn right into the PI parking lot entrance. Parking is not available at Perimeter Institute. If you plan on driving to Waterloo, please contact Stephanie Mohl for parking options. Participants need to ensure that they have the proper travel documents and visas to enter Canada. Click here for full details regarding visas, customs, tax refunds and travel.